I had come to accept that having a horse was not a dream for this lifetime. Although I had ridden very briefly and in controlled circumstances a couple of times in my life (once at age 15 and once around age 40), I didn’t know horses at all, other than from books or movies. Then at age 56, it was suddenly an option. I was both excited and nervous. What if I was just too old? About nine months of riding lessons later, I am thrilled that I pursued this opportunity. I leave every lesson happy to have been on a horse. I am in the beginning stages of shopping for my own horse. I don’t dare to think of myself as a “horse person” yet, but I am definitely a horse lover. 1. Find an instructor who is near your own age. I learned this when I took up flute lessons again a few year’s ago. When an instructor is very much younger than you there can be tension about who is really in charge of the situation. It is not anyone’s fault but makes the teacher-student relationship more complicated. An instructor near your own age has important insights about the aging body. Besides that, the well-seasoned instructor will have a more full understanding of all the complications and concerns about riding, thus avoiding unnecessary problems. They will be more likely to have a good blend of ease with teaching and respect for what could go wrong. 2. Prepare and maintain your overall health and strength. I already exercise in a variety of ways regularly. If I did not have this base strength, I imagine that learning to ride would be much harder. Riding a horse is deceptively physical, especially for the newbie. My instructor assures me that once I get more confident, it will not seem quite so rigorous. Not to brag, however, I have not had any sore muscles from these lessons. I have gotten bruised near my iliac crest a couple of times, but that was fixed by switching saddles. I think my lack of noticeable soreness is also because of not making the lessons overly long. This lets necessary muscles strengthen gradually. I do get tired from the lessons. Some of the tiredness is from the mental concentration. It is important to not overdo the effort in a given lesson. This avoids injury from overuse and injury from being mentally overwhelmed. 3. Take lessons regularly. Learning anything is better done in regular, small doses than large sporadic ones. For the same amount of time invested, you will get better results with regular, small practice and learning. As adults, we can tend to put these sorts of lessons as last priority in the schedule. Try thinking of it as a time of refreshment, like going for a walk or going out for coffee with a friend. Riding lessons can be a nice mix of both social and physical activity. Give your brain a break from the stresses of life and ride a horse for a short time each week. 4. Look for horse people to talk to. It has been my experience that once a horse person knows you are interested, most of them love to talk to you about their horses! Ask them about their first horses. Ask them what are some of the most important things they have learned. 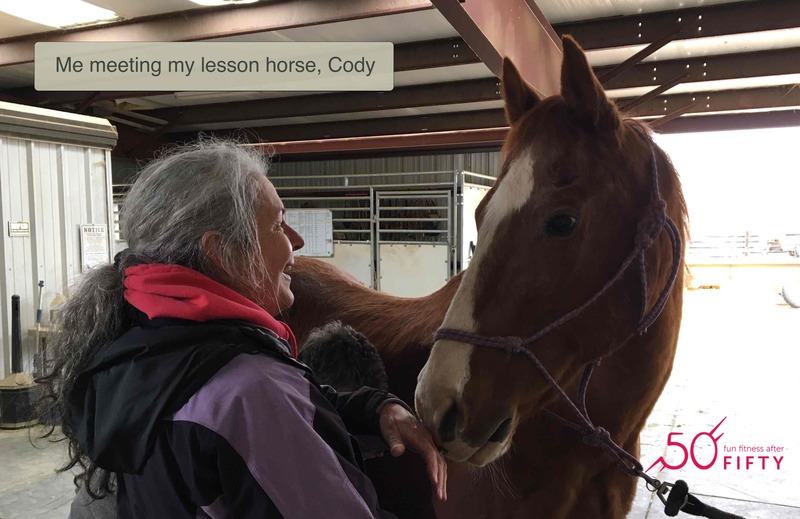 Once you are taking lessons, you will probably run into more horse people, but you can actively seek them out, too. I have found there are actually quite a few people who just ride for pleasure, who aren’t into competitions. I looked up riding clubs in the Treasure Valley and found Western Riding Club, which has been around since 1941. I plan on attending a meeting of theirs soon. The yearly fees are a very reasonable $30/person, $45/family. The Facebook group Idaho Horse Community was recommended to me by a couple of people, but I haven’t done more than look at the photos and read some posts. 5. Read books about horses. I don’t mean stories, though they could be inspirational and fun. I mean information or how-to books. Such books cannot replace lessons, but they have helped me understand some of the conversations I hear around the arena and stables. They also help me know not only what kinds of questions to ask, but terms that will make the question more clear. One book that has been particularly helpful is From the Ground Up: Horsemanship for the Adult Rider. The author did not start riding horses until age 35. The book is out of print, but quite a few copies are available used on Amazon.com. One of my horse-loving friends actually met the author years ago. Another good resource is the DK Smithsonian Handbook, Horses, by Elwyn Hartley Edwards. It can be challenging to remember important horse terminology for body parts, but this is a quick and colorful reference. 6. 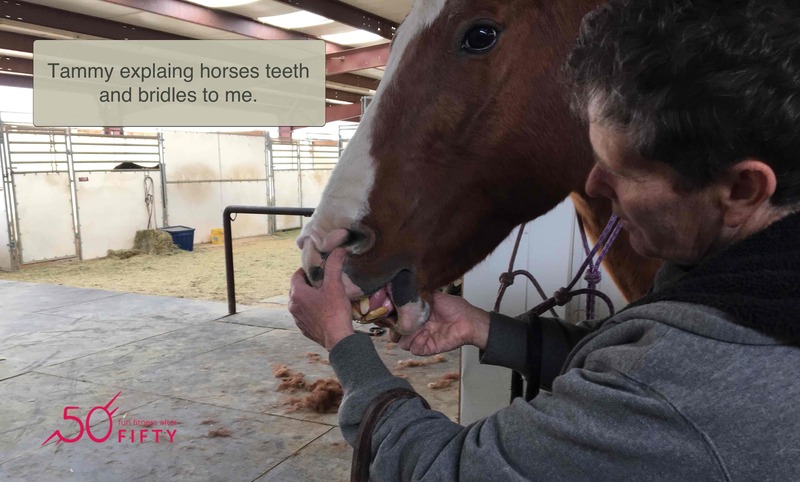 Help take care of horses whenever possible. 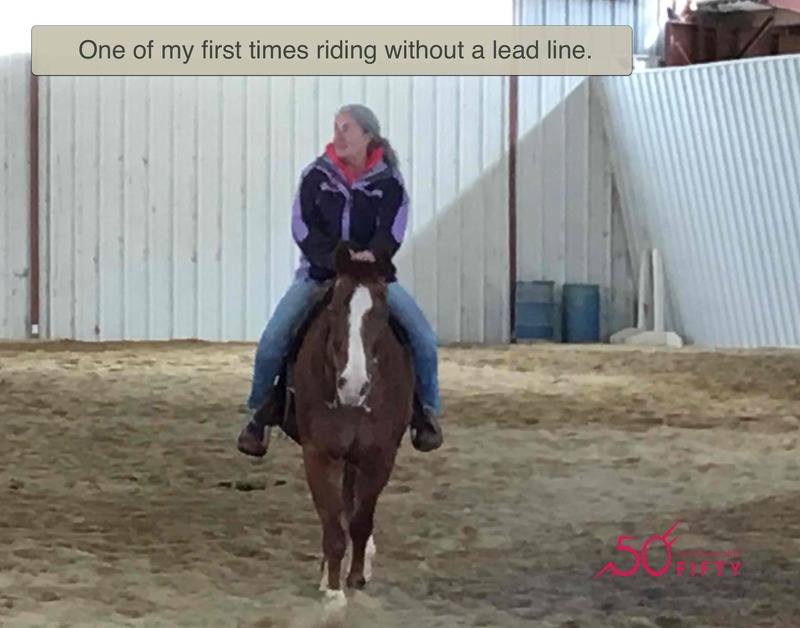 For instance, I help as much as I can with the care of the lesson horse before and after the lesson. The added time with the horse gives me insight into behavior and provides situations to ask more questions than I can atop a horse trying to ride. While hanging around doing this care, I inevitably end up being able to observe other people and their horses. I also learn more about equipment and nutrition. I’m not out to prove I’m indestructible or can do everything the same as when I was young. I am acutely aware of not wanting to unnecessarily injure myself. But I also know that I won’t be safer just by sitting around. I also think that both learning new things and being around animals is good for the soul. If done with wisdom and patience, I don’t think I’m too old to learn to ride a horse. I think I have some advantages of past experience to help balance the disadvantages of an aging body. You will have to make such a decision for yourself, but don’t just not do it because you are a “certain” age. 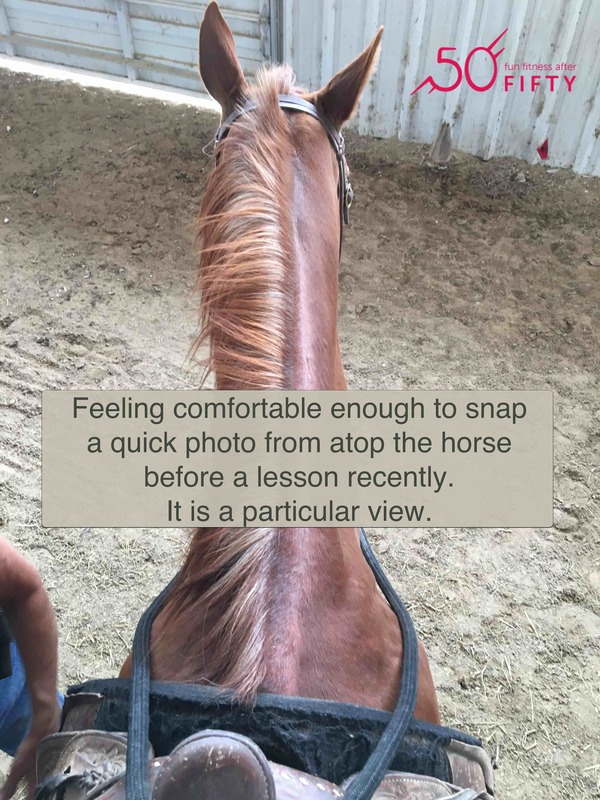 This entry was posted in The D&B Blog and tagged Horse, Horse Training. Bookmark the permalink.